At the very end of the larval stage Drosophila expectorate a glue secreted by their salivary glands to attach themselves to a substrate while pupariating. The glue is a mixture of apparently unrelated proteins, some of which are highly glycosylated and possess internal repeats. Because species adhere to distinct substrates (i.e. leaves, wood, rotten fruits), glue genes are expected to evolve rapidly. We used available genome sequences and PCR-sequencing of regions of interest to investigate the glue genes in 20 Drosophila species. We discovered a new gene in addition to the seven glue genes annotated in D. melanogaster. We also identified a phase 1 intron at a conserved position present in five of the eight glue genes of D. melanogaster, suggesting a common origin for those glue genes. A slightly significant rate of gene turnover was inferred. Both the number of repeats and the repeat sequence were found to diverge rapidly, even between closely related species. We also detected high repeat number variation at the intrapopulation level in D. melanogaster. Most conspicuous signs of accelerated evolution are found in the repeat regions of several glue genes. Animals interact with their environment (viruses, bacteria, food, chemicals, conspecifics, etc.) in many different ways, particularly through their immune and sensory systems. As animals adapt to new places, the way they interact with their environment is expected to change. Accordingly, the gene families that have been shown to exhibit accelerated rates of gene gain and loss in several animal groups are mostly genes that mediate the interactions with the environment: immune defense, stress response, metabolism, cell signaling, reproduction and chemoreception . Rapid changes in gene copy number can lead to fast phenotypic changes via gene deletion and can provide raw material for genes with new functions via gene duplication [2, 3]. Rapid turnover of genes within a gene family has also been shown to correlate with fast evolution at the sequence level [4, 5]. One particularly interesting environmental interaction occurs in Drosophila. Metamorphosis is a critical stage of fruitfly development  during which the animal is vulnerable and motionless. In Drosophilids pupae are generally attached to a substrate until the imago leaves the puparium. It is critical for the pupa to be firmly attached in order not to be moved away by some external event (i.e. rain or wind). Furthermore, for the emerging adult to be able to hold on the external substrate and thus get out of the pupal case, it is necessary for the pupa to adhere to a substrate, whether dry or wet. When the pupal case freely moves and is not attached, adults are unable to hatch and eventually die (J. R. David, personal communication). Here we focus on the Salivary gland secretion (Sgs) genes, a functional group that mediates the physical interaction of flies in the genus Drosophila with an external substrate during metamorphosis. The Sgs genes encode proteins that make up the glue produced by Drosophila larvae that serves to attach the animal to a surface where it can undergo metamorphosis. In D. melanogaster, the glue is composed of several salivary gland secretion proteins which accumulate in the salivary glands of late third instar larvae . As the puparium forms, the bloated salivary glands release their contents through the mouth. This secretion then hardens within seconds of contact with the air and becomes a glue which firmly attaches the pupa to the substrate. Pupariation sites of Drosophila species in nature have not been extensively characterized, but a large variety of of pupariation sites have been found. In the wild, D. melanogaster pupae have been found adhered to wood, fixed to grape stalks, attached to the dry parts of various rotten fruits, or adhered to one another on the land beneath grape stalks [8–10]. D. mauritiana pupae may be found on the surface of decaying Pandanus fruit, which is hard and lignous (D. Legrand, personal communication). Many Hawaiian Drosophila species pupariate several inches deep in the soil . Some other Drosophila species, such as D. sechellia, D. simulans, and the invasive D. suzukii, appear to pupariate directly within the wet rotten part of fruits (J. David, personal communication, ). Given the diversity of pupariation sites, we hypothesized that the different Drosophila species would require distinct types of glue meaning that the Sgs genes might evolve rapidly within the genus. The glue genes have long been an important model for the regulation of gene expression. In the 1970s and 1980s it was discovered that genes for proteins contained in salivary secretions correlate with the chromosomal location of major puffs. This led to the discovery that, on an acid-urea electrophoresis gel, the salivary glue was resolved into five major bands, numbered from 1 to 5 in order of increasing electrophoretic mobility [13, 14]. Band 2, which was variable and detected in many other tissues, was considered to be a tissue contamination rather than a true glue protein . From this, seven glue genes were eventually identified, and their nucleotide sequences are now well characterized: Sgs1 (band 1, CG3047, 2 L), Sgs3 (band 3, CG11720, 3 L), Sgs4 (band 4, CG12181, X), Sgs5 (band 5, CG7596, 3R), Sgs7 (CG18087, 3 L), and Sgs8 (CG6132, 3 L) and Eig71Ee (also named geneVII I71–7 or gp150, CG7604, 3 L) [15–25]. Eig71Ee, located at position 71E, is not only expressed in salivary glands but also in hemocytes and in the gut, where it appears to be involved in immunity and clotting [26–28]. A sixth electrophoretic band migrating slightly slower than the Sgs3 protein was also detected in a few D. melanogaster lines [14, 29, 30]. The nucleotide sequence of the corresponding gene, Sgs6, remains unknown but cytogenetic and genetic mapping indicates that Sgs6 is located in region 71C3–4 and differs from Eig71Ee [21, 26, 30]. The three genes Sgs3, Sgs7 and Sgs8 form a tightly linked cluster on the 3 L chromosomal arm at position 68C [31, 32]. All glue genes were found to start with a signal peptide. The largest glue genes, Sgs1, Sgs3 and Sgs4 and Eig71Ee were shown to harbor numerous internal repeats of amino acid motifs, rich in proline, threonine and serine [16, 23, 27, 33]. Molecular studies showed that the number of internal repeats was variable between strains in Sgs3 , and Sgs4 . Additionally, consistent with missing protein bands, a few laboratory strains were inferred to carry loss-of-function mutations in Sgs4 [7, 13, 33, 35], Sgs5  and Sgs6 [14, 29, 30]. In the present study, we characterize the diversity and evolution of the Sgs genes within the Drosophila genus. We inferred loss and gain of glue genes and we investigated repeat number variation and sequence repeat diversity across 19 species and across paralogs. We used the six Sgs genes and Eig71Ee annotated in D. melanogaster as BLAST queries to identify their putative homologs in 19 other Drosophila species (Table 1). The homologs are summarized in Fig. 1 and Table 2. In D. melanogaster, the glue genes are “extremely highly” or “very highly” expressed in late larval salivary glands according to the RNAseq data in Flybase. But transcript data that would be useful for annotating the genes were not available for all species, probably because the expression window of the glue genes (late third larval instar and only in salivary glands) is narrow . The organization of the Sgs genes was found to be generally conserved across the Drosophila species we investigated (Fig. 1). Proper identification of each ortholog was based on sequence similarity and, when possible, synteny. We describe below our findings for each category of Sgs genes. We found that Sgs5 has a tandem paralog in D. melanogaster, located ca. 300 bp upstream of Sgs5 (CG7587, hereafter named Sgs5bis), sharing 46,3% identity and 66,9% similarity at the protein level. Similar expression profiles from Gbrowse (flybase.org) and FlyAtlas (flymine.org) show that Sgs5bis is co-expressed with Sgs5 during the late third larval instar in dissected salivary glands, and both genes harbor two introns in all species. To our knowledge, this paralog has not been mentioned earlier. The Sgs5/5bis pair is widely distributed in our species sample, and is therefore probably ancestral to most of the species studied. Occasional losses of either Sgs5 or Sgs5bis occurred at least four times (Fig. 1): 1) loss of Sgs5bis in D. mauritiana, where a relictual sequence may still be recognized, 2) loss of Sgs5bis in D. elegans, 3) loss of Sgs5bis in D. rhopaloa, 4) loss of Sgs5 in D. erecta. These patterns of loss suggest that Sgs5 and Sgs5bis can replace each other functionally. There is no Sgs5 nor Sgs5bis in D. willistoni. In D. ananassae, the orthologous sequence of Sgs5bis (formerly Dana\GF19880 in FlyBase release R1.3, with a different intron/exon structure) has been withdrawn from the genome annotation for reasons unknown to us though it is in conserved synteny relative to D. melanogaster. In D. virilis and D. pseudoobscura, a single Sgs5/5bis gene was identified. A phylogeny of all Sgs5 and Sgs5bis amino acid sequences (Fig. 2) revealed a clear separation in the gene sequences of the two groups, Sgs5 and Sgs5bis. The D. virilis gene (annotated as uncharacterized protein Dvir\GJ24445) and the D. pseudoobscura Sgs5/5bis gene (annotated as uncharacterized protein Dpse\GA20459) were clustered with the Sgs5bis genes and they shared with most other Sgs5bis sequences a motif Gln-Ala-Thr in the signal peptide. This suggests that D. virilis and D. pseudoobscura possess an ortholog of Sgs5bis. The D. virilis and D. pseudoobscura lineages diverged first in our sample (Fig. 1), but it cannot be determined whether they have lost Sgs5 or if the Sgs5-Sgs5bis gene duplication arose after their separation. In this case, the ancestral gene before the duplication was probably Sgs5bis. The genes Sgs3, Sgs7 and Sgs8 form a tight cluster, 4.5 kb long, on the 3 L arm in D. melanogaster  and share sequence similarities  in their N-terminal and C-terminal parts, however Sgs3 contains internal repeats whereas Sgs7 and Sgs8 do not (Sgs7 and Sgs8 are small proteins, about 75 amino acids in length). When the internal repeats of Sgs3 are excluded, the amino acid identity amongst the three genes in D. melanogaster is 51.3% between Sgs3 and Sgs7, 48.7% between Sgs3 and Sgs8, and 46.7% between Sgs7 and Sgs8. Additionally Sgs3, Sgs7 and Sgs8 share a phase 1 intron position, interrupting the signal peptide sequence . In the clade D. yakuba / santomea / erecta, Sgs7 and Sgs8 are inverted with respect to the D. melanogaster arrangement (Fig. 1). Sgs7 is duplicated in D. yakuba (Dyak\GE20214 and Dyak\GE21218) and D. santomea (Fig. 1) with the two copies being inverted relative to each other and having only one, nonsynonymous, nucleotide difference. Sgs8 lies between the two Sgs7 copies, and has the same orientation as Sgs3. In species outside the D. melanogaster subgroup, all the Sgs3, Sgs7 and Sgs8 sequences also have the same intron, with slightly different positions depending on codon indels before the intron. Notably, D. suzukii is the only species in our study that has lost Sgs3. D. suzukii retained Sgs8 and has undergone an amplification of Sgs7, containing three identical copies. In D. pseudoobscura, D. ficusphila, D. rhopaloa (see Fig. 1), Sgs7 and Sgs8 could not be identified. However, a BLAST search using the Sgs7 or Sgs8 sequences of D. melanogaster as queries, returned several Sgs3-like genes (i.e. long proteins with internal repeats showing N-terminal and C-terminal parts similar to Sgs3). In those species with no Sgs7, no Sgs8 and several Sgs3-like genes occupying the physical location of Sgs7 and Sgs8, it is tempting to infer that the ancestral Sgs7 and Sgs8 have gained internal repeats. According to such a hypothesis, at least in some cases, the non-repeated parts of those Sgs3-like protein sequences are expected to cluster with Sgs7/8. To disentangle the relationships among Sgs3–7-8 paralogs, we constructed a phylogeny using an alignment of the non-repeated parts of the protein sequences (Fig. 3). The tree is discordant with the assumed species phylogeny, but shows a clear separation between Sgs3/Sgs3-like and Sgs7/Sgs8 genes. The exceptions are D. bipectinata and D. willistoni, whose Sgs7/Sgs8 sequences are clustered with the Sgs3 sequences, with low support due to short sequence lengths. This suggests that those Sgs7/Sgs8 sequences are old Sgs3-like sequences which have lost their internal repeats. However, with such low support throughout the tree, we cannot confirm this hypothesis or infer whether there were two ancestral Sgs3 and that subsequent losses occurred. We find that Sgs1 is only present in the melanogaster subgroup and so-called Oriental subgroups (with a loss in D. erecta), which suggests that it originated in the ancestor of this clade. The Sgs1 sequence identified by BLAST search in the genome database (see Materials and Methods) was found to have many stop codons in the second half of the repeat region and had not been annotated as a coding sequence. However, based upon the surrounding repeat sequences, we found that inserting a C at position 1829 (from start) would restore the reading frame, translating into a putative 2245 amino acid protein. Inspection of another D. suzukii genome sequence  (contig CAKG01017146) showed that there is indeed a C at position 1829 and that Sgs1 is 2245 amino acid long, pointing to an error in the original annotation. Since position 1829 lies in the middle of a long repeat-containing region which prevents PCR amplification, we did not try to check experimentally for the missing C in the first D. suzukii genome sequence. In all the Sgs1 genes identified, except in D. elegans, an intron was found at the same position and phase as in Sgs3, Sgs7 and Sgs8. There is also a loose similarity in the N-terminal and C-terminal parts of Sgs1 and Sgs3 (in D. melanogaster about 14% identity between Sgs3 and Sgs1 excluding the repeats). This suggests that Sgs1 belongs to the same family as Sgs3/Sgs7/Sgs8 genes. 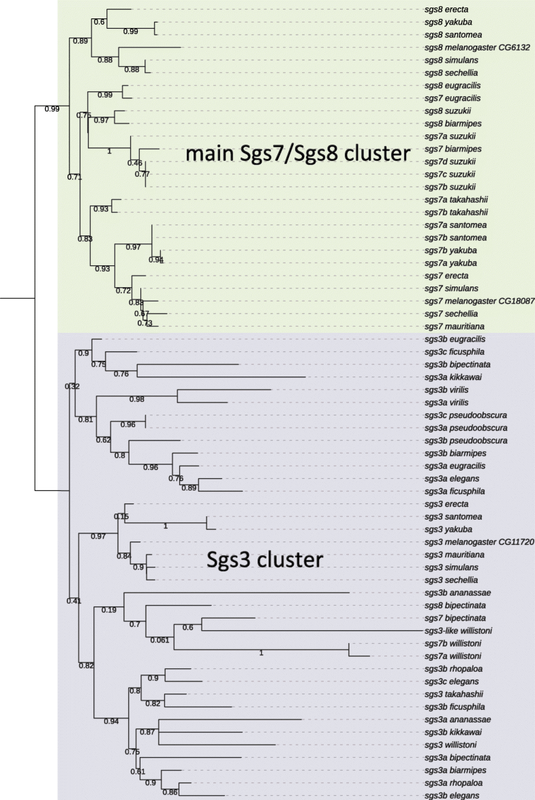 Sgs4 is intronless and is not present outside the D. melanogaster subgroup (Fig. 1, Table 2). We find no similarity between Sgs4 and any other sequence in any genome. Previously some sequence similarity between Eig71Ee and Sgs4 had been reported , but only in the low complexity repeat regions of the genes. Eig71Ee is found in all the D. melanogaster subgroup species and in some of the so-called Oriental species, where it has been annotated as mucin2, or extensin in D. takahashii, or even, erroneously, as Sgs3 in D. suzukii. We also detected the N-terminal parts of the gene in the D. ananassae group thus making the phylogenetic distribution of the gene unclear (Table 2). More interestingly, we noticed that Eig71Ee harbors an intron at the same position as the ones found in Sgs3, Sgs7, Sgs8 and Sgs1. This result argues for a certain relatedness among those genes. However, using Eig71Ee as a TBLASTN query did not retrieve any hits from any Sgs genes and the Eig71Ee amino acid sequence does not align with the Sgs sequences. Our analysis reveals that the seven annotated genes that code for glue proteins can be grouped into three gene families. Sgs1, Sgs3, Sgs7, Sgs8, and Eig71Ee comprise one of the three families since all of them share a phase 1 intron at the same position, interrupting the signal peptide sequence. Sgs4 then forms its own family and the Sgs5 and 5bis comprise the third family. We used CAFE  to reconstruct ancestral copy numbers throughout the Drosophila phylogeny and to test whether these three gene families evolve at an accelerated rate along any Drosophila lineage. For the CAFE analysis Eig71Ee was not included due to uncertainties about its presence in some species. We find that the Sgs4 and Sgs5-5bis families do not evolve faster compared to other gene families present in the Drosophila genomes (p = 0.58 and p = 0.107, respectively; Additional file 1: Table S1), however the Sgs1–3–7-8 family was found to evolve rapidly (p = 0.005; Additional file 1: Table S1). Overall, this family seems to be prone to duplication and loss (Additional file 2: Figure S1) and we find that this signal for rapid evolution is driven mostly by small changes on many lineages (i.e. a gain or loss of 1 gene) rather than large changes on one or a few lineages. Sgs1, Sgs3 and to a lesser extent, Sgs4 and Eig71Ee, are characterized by long repeats often rich in threonine and prone to O-glycosylations, in addition to their signal peptide and conserved C-terminus (Table 3 summarizes the characteristics of the repeats). We checked that across all populations in PopFly, the D. melanogaster Sgs5 protein is devoid of internal repeats while most other species, including close relatives of D. melanogaster, contain repeats mostly consisting in Pro-(Glu/Asp) pairs. Indeed the Sgs5 protein length is highly variable across species. For example, D. kikkawai harbors a long additional stretch (127 amino acids) containing 60% of acidic residues. Interestingly, the paralog Sgs5bis never has repeats. Sgs7 and Sgs8 are much smaller proteins, without any repeats and are rich in cysteine (12–14%). The conserved C-terminal sequences of Sgs proteins are important to characterize because the repeats are quite variable in motif, length and number, even between closely related species, meaning that, most often, glue proteins may be retrieved only based on their conserved C-terminal part. The C-terminal segments are about 120 amino acids long in Sgs1, 50 amino acids in Sgs3, 120 amino acids in Sgs4, 115 amino acids in Sgs5/5bis and 135 amino acids in Eig71Ee. The longest Sgs protein is Sgs1 in D. suzukii (2245 aa), which harbors ca. 63 repeats of a 29 amino acid, threonine-rich motif so that threonine makes up 40% of the residues. In D. melanogaster, Sgs1 is also very long (1286 aa) due to 86 repeats of a motif of 10 amino acids, also threonine-rich (46%). 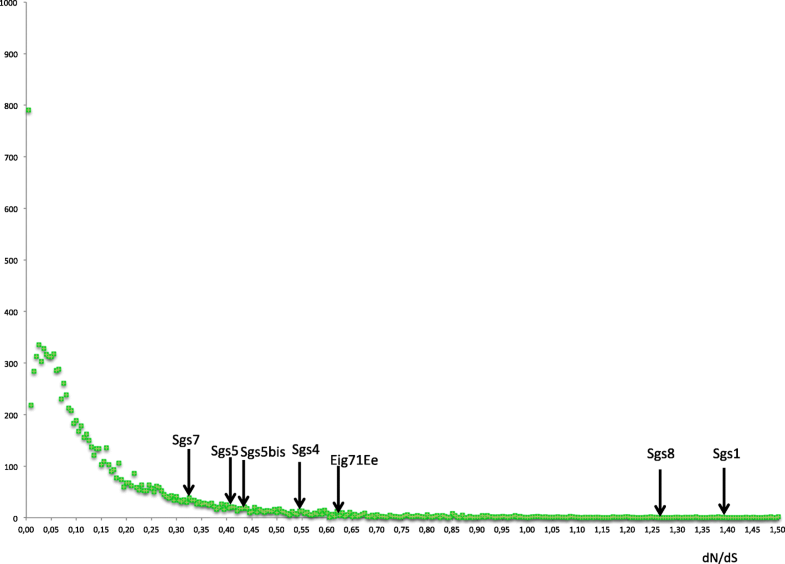 The shortest Sgs1 protein is the one of D. sechellia (492 aa). In all the species where it exists, Sgs1 is also rich in proline (12–18%). Sgs3 has a similar amino acid composition as Sgs1. Repeats can also be quite different between paralogs. For example, in D. eugracilis, while the two Sgs3-like genes are physically neighbors, Sgs3a has several repeats of CAP(T)n, whereas Sgs3b has ca. 65 KPT repeats. In D. elegans, the three Sgs3-like proteins also have quite different repeats (Table 3). Sgs4 is richer in proline than in threonine (18% vs. 16% in D. melanogaster) and contains 10% cysteine residues. Between closely related species the number of repeats varied enormously and the repeated sequence diverged sometimes rapidly (Table 3). In the following we examine some specific examples to highlight these patterns. D. simulans, D. sechellia, and D. mauritiana form a clade, which split less than 300,000 years ago . Their Sgs1 genes harbor the same repeated sequence but the number of repeats ranges from 40 in D. simulans to 13 and 22 in D. mauritiana and D. sechellia, respectively. Likewise, Sgs3 is very similar in the three species, except in the number of repeats. There are no repeats in D. simulans, but threonine-rich stretches; in the published sequence of D. mauritiana, there are three tandem occurrences of CAPPTRPPCTSP(T)n; in D. sechellia, several CKP(T)6 repeats. Sgs4 shows shared repeats C(D/N)TEPPT among these species, with many more repeats in D. mauritiana. In contrast, in the sibling species D. yakuba and D. santomea, which diverged 0.5 million years ago [39, 40], Sgs3, Sgs4 and Sgs5 harbor the same repeat sequences and the same number of repeats (Table 3). Sgs4 genes show 91% identity at the protein level with the same 23 repeats; Sgs5 97% identity and no repeats. Another pair of species worth of interest is D. suzukii/D. biarmipes, considered to have diverged ca. 7.3 mya . As mentioned above, only Sgs1 and Sgs5 can be compared because D. suzukii has lost Sgs3, and Sgs4 is limited to the melanogaster subgroup. Despite a longer divergence time than for the previous comparisons, the Sgs1 29 amino acid repeats are similar in the two species but D. suzukii has many more repeat units. In the non repeat parts, identity is 69.3%; Sgs5 is well conserved even in the repeat region, with an overall identity of 76.4% in amino acids, and 84.8% in the non-repeat parts. A last pair of related species (despite their belonging to different subgroups) is D. elegans/D. rhopaloa. We estimate their divergence time to be roughly 12 million years based on molecular data (see Methods) and find that their Sgs proteins are very similar overall. This similarity extends to the repeat regions, with the exception being the repeats in Sgs3, which exists as four gene copies in D. rhopaloa. Their Sgs5 proteins have a high overall identity (75%), including repeats (Glu-Pro)n. In the non-repeat regions, identity rose to 82%. Indeed we often found more divergence among paralogs within a genome than across orthologous proteins. Structure prediction programs (IUPred , PrDOS , disEMBL , PONDR ) indicate that the repeat regions of Sgs1, Sgs3, Sgs4, Sgs5 and Eig71Ee are intrinsically disordered (Fig. 4). Only IUPred and PrDOS indicate Sgs4 repeats to be ordered, in disagreement with the other predictors. Owing to the difficulty of short-read sequencing methods to deal with the repeated sequences found in glue genes, we could not get a species-wide insight of repeat number variation (RNV) in D. melanogaster. Therefore, we resequenced Sgs3 and Sgs4 in strains from various geographic locations using classical Sanger sequencing (Table 4). We find striking inter- and intrapopulation variation in the number of repeats: for Sgs3 (Additional file 3: Figure S2 and Additional file 4: Figure S3, Table 4), there was at least 9 repeat difference between the shortest and the longest allele (22 to 31); for Sgs4, we find a range of 18 to more than 26 repeats (Additional file 5: Figure S4 and Additional file 6: Figure S5, Table 4). Regarding the data from the Drosophila Genome Nexus study (Cairo population), we observed that the repeat region of Sgs4 was erroneously reconstituted, often underestimating the repeat number, compared to our Sanger sequencing. We also sequenced the Sgs3 and Sgs4 genes in wild-caught D. mauritiana individuals. For Sgs3 we found variation in the number of stretched threonines (10 or 12) and in the number of repeats (Additional file 7: Figure S6A and Table 4). For Sgs4, we found that the actual sequences were much longer than the sequence available online, and variable in length, even at the intra-population level, ranging from 25 to 35 repeats of the 7 amino acid motif (Additional file 7: Figure S6B and Table 4). Despite the rather low quality of sequences in the Drosophila Genome Nexus data set, we searched for putative premature termination codons (PTC) in Sgs genes of D. melanogaster, which could lead to non-functional proteins. The search was limited to non-repeat regions. We find PTC in Sgs4 of several lines that truncated the protein at the beginning of its conserved C-terminal part. We confirmed experimentally the presence of this PTC in 10 lines of the Cairo population EG (K165stop) (Additional file 6: Figure S5 and Table 4). We also found putative PTC for Sgs5 in a few lines (W161stop, that is sub-terminal, and maybe not detrimental), and experimental verification confirmed it in one Ethiopian line (EF66N); in Sgs5bis, we found a putative PTC (C33stop) in six African lines from Rwanda (RG population) and Uganda (UG population). We also find a putative PTC for Sgs1 in a few lines from USA and Cairo (P49stop), which was confirmed by resequencing the Egyptian line EG36N. This nonsense mutation required two substitutions from CCA to TAA in all cases. Interestingly, EG36N also has a truncated Sgs4, warranting more careful investigation of its glue gene. In Sgs3, no PTC was found, but putative PTC were found for Eig71Ee in two lines, EA90N (S345stop) and RAL894 (W380stop), both in the C-terminal region. One putative PTC was found in Sgs7 (Q47stop, line USI33), but was not checked experimentally. No PTC was found in Sgs8 sequences. Stretches of Ns found in non-repeat regions could possibly, at least in some cases, turn out to be true deletions, which deserves further investigation. There is a possibility that some PTCs could experience stop codon readthrough  leading to translation of the correct protein. For instance this is possible in Sgs4 because the nonsense mutation was not accompanied by other mutations, which would be expected in case of relaxed selection (unless the nonsense mutation is very recent). Further studies of the protein content of the salivary glands in those strains will be needed to check whether Sgs4 is produced and if it is full-size. Given that glue proteins harbor RNV and our hypothesis that they could be putative targets for fast selection, we wanted to test whether glue gene coding sequences evolve quickly. To this end, we computed substitution rates of the Sgs genes between D. melanogaster and D. simulans (Table 5). We did not include Sgs3, because the internal repeats were very different and not alignable between the two species. This, at any rate, shows that this particular gene has evolved rapidly. Although it had the biggest size and the highest number of repeats, we were able to make an estimate for Sgs1 because the repeats were rather similar in D. melanogaster and D. simulans. We removed the unalignable parts before computation, therefore underestimating the real evolutionary rate. Rate calculations were similarly performed for Eig71Ee, Sgs4 and Sgs5. The computed values for the Sgs genes were compared to the genome-wide distributions of dN/dS between these species (Fig. 5) using data from the flyDIVaS database . All dN values were within the highest quartile, and Sgs1, Sgs4 and Sgs8 were within the highest three centiles. Furthermore, high dN/dS values were found for Sgs1 (dN/dS = 1.393) and Sgs8 (dN/dS = 1.259), indicating accelerated protein evolution. The dN value of Sgs8 (0.1789) contrasts with the one of its close relative Sgs7 (0.0475). We wondered if Sgs8 had also evolved faster than Sgs7 in other pairs of related species. Table 6 shows the results for other species pairs known to be close relatives: D. melanogaster/D. sechellia, D. simulans/D. sechellia; D. yakuba/D. erecta; D. biarmipes/D. suzukii. Comparisons between D. yakuba/D. erecta and D. biarmipes/D. suzukii showed no evolutionary rate difference between Sgs7 and Sgs8. However we found that between D. simulans and D. sechellia Sgs7 has a dN ten times higher than that of Sgs8. This pattern is opposite that the D. simulans vs. D. melanogaster comparison. In fact, D. sechellia Sgs7 is more divergent than D. simulans from D. melanogaster Sgs7, whereas Sgs8 has not diverged further. Obviously, the small number of substitutions points to a high variance, and the difference may be not significant. To test for adaptive evolution after the “out of Africa” event of D. melanogaster , we measured the nucleotide diversity π and divergence Dxy between one population from Zambia, (ZI) thought to be within the original geographical area of D. melanogaster, another African population (EF, Ethiopia) and two derived populations, from France (FR) and USA (Raleigh, RAL). This study was limited to the coding sequences of Sgs5 and Sgs5bis because these genes conveniently lack internal repeats and the gene size is not too short, (as opposed to Sgs7 and Sgs8). Due to the numerous residual unidentified nucleotides in the Drosophila Genome Nexus data, the number of sites taken into account was actually much smaller than the sequence size, e.g. for Sgs5bis, 278 sites left over 489 in RAL. We compared the overall π and Dxy between these populations . Roughly, for both genes π is higher in ZI than in EF, FR and RAL (Tables 7 and 8). This matches the pattern observed for the whole genome and is as expected for the region of origin of this species. We found that divergences Dxy are less than expected from the whole genome, except for the ZI/EF comparison of Sgs5 (Tables 7 and 8). Both genes gave similar results. Therefore, we find that the glue genes Sgs5 and Sgs5bis do not show particular divergence pattern across populations, which could have been related to a change in population environment. We also searched for episodic diversifying selection (EDS) among species for the three genes entirely devoid of repeats, Sgs5bis, Sgs7 and Sgs8 using the branch-site REL test (BS-REL) from the HyPhy package. 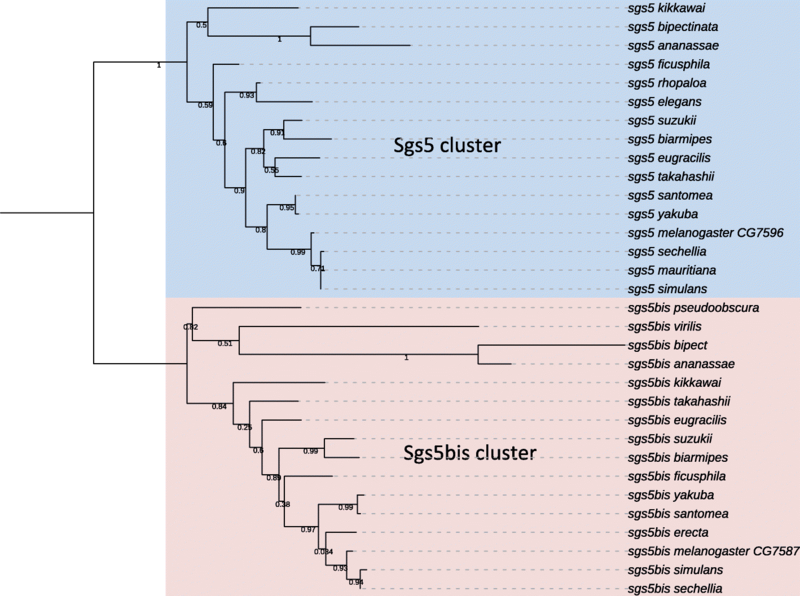 No accelerated evolution was detected for Sgs5bis, whereas one branch (D. santomea-D. yakuba clade) underwent EDS for Sgs7 (corrected p-value 0.012) and one branch (D. erecta-D. yakuba-D. santomea) underwent EDS for Sgs8 (corrected p-value 0.015) (Additional file 8: Figure S7). These results must be considered with caution given the small size of the data set, but anyway do not favor a specific selection regime, regarding single nucleotide (or amino acid) polymorphism. We have investigated the presence and characteristics of Sgs genes and proteins in several Drosophila species belonging to the two main subgenera Sophophora and Drosophila, with particular emphasis on species closer to D. melanogaster. We have identified the various Sgs genes through sequence similarity with D. melanogaster. While this study is extensive, it is of course possible that we may have missed glue genes completely different from the ones of D. melanogaster. In order to get the full collection of glue genes we require transcriptional evidence from late larval salivary gland RNA for each species studied. Interestingly, according to our census, the seven genes characterized for years in D. melanogaster are far from being always present in the other genomes, although the seven members are generally preserved in the D. melanogaster subgroup. Our results are in disagreement with the succinct interspecific study of Farkaš . We also propose here an eighth glue gene, Sgs5bis. Based on its close sequence homology and its co-expression with Sgs5 we propose that these two genes are tandem paralogs. We notice that Sgs5bis never contains internal repeats whereas Sgs5 often harbors more or less developed repeat motifs, although not in D. melanogaster. Given our data, and notwithstanding the unbalanced taxonomic sampling which may mislead us, we suggest that the ancestor of the species studied here had only Sgs3 and Sgs5bis (Fig. 1). It is likely that Sgs7, Sgs8, and perhaps also Sgs1 and Eig71Ee, originated from duplications of Sgs3. The important differences in repeat motifs between duplicate Sgs3 (e.g. in D. eugracilis) are striking and suggest a high rate of evolution, or independent acquisition of repeats from a repeatless or repeat-poor parental gene. A part of the sequence we named Sgs3-like in D. willistoni is reported in FlyBase as GK28127, with transcription on the opposite strand, and without a homolog in D. melanogaster. Thus, it is possible that some duplicates of Sgs3 may have been actually recruited for other functions other than glue production. In this respect, it is also possible that Eig71Ee, which has been studied mostly for its immune functions, could be an ancient glue protein, which gained new functions. The repeat-containing glue proteins are typical of secreted mucins. Mucins are highly glycosylated proteins found in animal mucus and they protect epithelia from physical damage and pathogens . In D. melanogaster, more than 30 mucin-like proteins have been identified  but the precise function of most of them remain unknown. It would be interesting to compare the glue genes with the other mucin-like genes in terms of protein domains and sequence evolution. In D. melanogaster, repeats similar to those of Sgs3 (KPTT) are found in the mucin gene Muc12Ea. The high level of glycosylation is thought to favor solubility at high concentration while accumulating in salivary glands (). The richness in cysteines suggests that, upon release in the environment through expectoration, disulfide bridges between glue proteins may be formed by cysteine oxidation by air, making a complex fibrous matrix. Intramolecular disulfide bonds can also be predicted (). Examination of the amino acid composition of the glue proteins suggests that the numerous prolines may induce a zigzag-like shape while serine and threonine, which are very abundant, besides being prone to O-glycosylation, make them very hydrophilic and favor interaction with the solvent and then solubility while preventing folding. The presence of regularly scattered arginines or lysines (or sometimes aspartic and glutamic acids) would add charge repulsion, helping the thread structure to be maintained flat and extended. This is similar to linkers found between mobile domains in some proteins . The shorter Sgs7/Sgs8 would, considering their richness in cysteine, bind the threads together through disulfide bonding. In the frame of an intrinsically disordered structure (Fig. 4), it is not surprising to observe a high level of repeat number variation (RNV) even at the intra-population level. It has been reported ([54, 55]) that in proteins with internal domain or motif repeats, if these repeats form disordered regions and do not interact with the rest of the protein chain (for a cooperative folding for example), they are more prone to indels which are better tolerated, and favored by the genetic instability of repeated sequences. It is likely that, within a certain repeat number range, variations in repeat numbers might have little effect on the chemical and mechanical properties of the glue. In fact it is likely that the differences in repeat motif sequences rather than the number of repeats would change the mechanical and physical properties of the glue. Accordingly, we measured rather fast rates of evolution, but found no clear indication of positive selection. One reason why the evolution of the repeats is fast (across related species or across paralogs) might be that the constraints to maintain disorder and the thread-like shape are rather loose (). We do not know the respective roles of the different Sgs proteins in the final glue. Farkaš  mentioned that Sgs1 could have chitin-binding properties, which is in line with the function of the glue. He also proposed roles of specific components before expectoration, inside salivary gland granules, related to packaging, solubility. The absence of some glue components may have consequences on its properties and may play a role in adaptation, as suggested by . Gene loss, gene duplication, or repeat sequence change may modify the strength of the glue or its resistance to water or moisture, to acidity (of a fruit) and therefore might be linked to pupariation site preference. 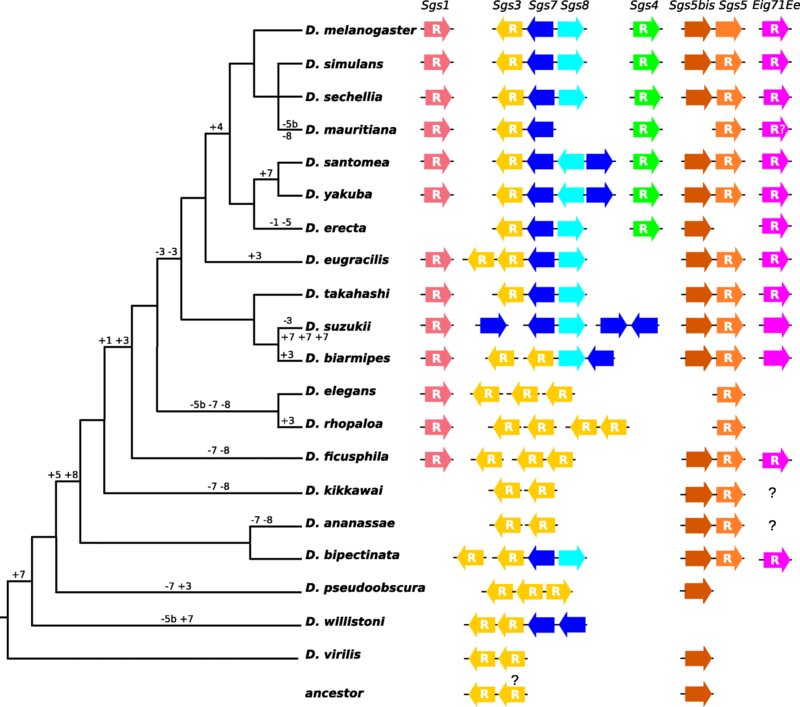 D. suzukii lacks both Sgs3 and Sgs4, and has duplications of Sgs7. D. suzukii pupae are found mostly in the soil just below the surface, and less rarely within ripe and wet fruits such as cherries or raspberries, the pupa half protruding [56, 57]. The extensive loss of Sgs genes in D. suzukii may be related to its pupariation in soil. Shivanna et al. () have related pupariation site preference to the quantity of glue and, counter-intuitively, have reported that species that prefer to pupariate on the food medium in the laboratory produce more glue than species that pupariate on the glass walls of the vials. However, the chemical glue content was not investigated. Another study  compared pupariation site preferences between the sibling species D. mauritiana, D. sechellia and D. simulans. While D. simulans populations from the native region share pupariation preference in fruits with D. mauritiana and D. sechellia, worldwide populations preferably pupariate off-fruit, i.e. on a drier and harder substrate. Although the QTL associated with pupariation site preference in D. simulans and D. sechellia do not map to glue genes , it would be interesting to see whether, secondarily, significant variations in glue composition or quantity occurred and might be contrasted across D. simulans populations. Given its worldwide expansion associated with adaptation to multiple local environments including diverse pupariation sites, D. melanogaster is an interesting model to study the intraspecific evolution of Sgs genes in relation to adaptation. Interestingly, absence of Sgs4 protein was reported in a few strains from Japan and USA , most likely due to deletions or mutations in the promoter region. Our resequencing of a few Nexus lines revealed nonsense mutations within the coding sequence at position 165 in Sgs4, deleting the well conserved C-terminal part. The translational consequences for this protein and for final glue properties remain unknown. In addition to such qualitative protein variations, it is possible that the relative proportions of the Sgs proteins in the glue may change in D. melanogaster according to the ecological circumstances. In this respect, collecting wandering larvae from various substrates, analyzing their glue composition and designing adhesion assays to compare adhesive properties between various glues will be valuable. In conclusion, the pupal glue appears as a genetically and phenotypically simple model system for investigating the genetic basis of adaptation. The present work provides a first exploration of the evolution of glue genes across Drosophila species and paves the way for future studies on the functional and adaptive consequences of glue composition variation in relation to habitat and geographic and climatic origin. The seven annotated glue genes of D. melanogaster (Sgs1 (CG3047); Sgs3 (CG11720); Sgs4 (CG12181); Sgs5 (CG7596); Sgs7 (CG18087); Sgs8 (CG6132)) and Eig71Ee (CG7604) were used as BLAST queries for retrieving their orthologs in 19 other Drosophila species. The genome data used for each species is indicated in Table 1. BLAST searches were performed directly through GenBank, FlyBase , the SpottedWingFly base for D. suzukii  or using local BLAST program (v2.2.25) after downloading the genomes for D. santomea  and D. mauritiana . The BLASTP and TBLASTN programs were used , without filtering for low complexity, which otherwise would have missed the repeated regions. Repeats, when present, were often quite different from the repeats present in D. melanogaster Sgs sequences. Consequently, BLAST results were often limited to the C-terminal part of the targeted gene, which was the most conserved part of the proteins, and to a lesser extent to the N-terminal end. For each species, a nucleotide sequence containing large regions upstream and downstream of the BLAST hits was downloaded from InsectBase  or from species-specific websites when genome data was not present in InsectBase (Table 1). We used Geneious (Biomatters Ltd.) to identify by eye the coding regions, the start of which was identified by the signal peptide sequence. Putative introns were also identified manually, guided by the intron-exon structure of the D. melanogaster orthologs. In cases of uncertainties or missing sequence data, we extracted DNA from single flies of the relevant species (Table 4) and the questionable gene regions were amplified with primers chosen in the reliable sequence parts (Additional file 9: Table S2), and sequenced by the Sanger method using an ABI 3130 sequencer. For instance, we characterized the exact sequence corresponding to N stretches in the published sequence of D. mauritiana Sgs4; we found that the published premature termination codon (PTC) of D. biarmipes Sgs3 was an error and that three frameshifts found within 50 bp in D. sechellia Sgs1 were erroneous. Alignments of DNA or protein sequences were done using MUSCLE  implemented in Geneious and protein trees were computed using PhyML, as implemented in the online server Phylogeny.fr , drawn using iTOL , and rooted at midpoint. The substitution rates dN and dS values for over 10,000 coding sequences computed for D. melanogaster/D. simulans comparisons were retrieved from the flyDIVaS database  but Sgs genes were not included in this dataset. Thus, dN and dS were computed using yn00 in the PAML package (), removing the unalignable parts. We tested for episodic diversifying selection across species using the branch-site random effect likelihood (BS-REL) algorithm implemented in the HyPhy package [70, 71] at the Datamonkey server (classic.datamonkey.org) . We used only genes devoid of repeats to ensure reliable aligments, and we supplied species trees for the analysis. To infer ancestral gene counts in the three newly classified Sgs gene families and to determine whether the three newly classified Sgs gene families are evolving rapidly we first need to determine the average rate of gene gain and loss (λ) throughout Drosophila. Previous studies have estimated λ from 12 Drosophila genomes and found rates of 0.0012 gain/losses per million years  and 0.006 gains/losses per million years after correcting for assembly and annotation errors . However, since those studies numerous additional Drosophila genomes have been published. In order to update the gene gain/loss rate (λ) for this genus, we obtained 25 available Drosophila peptide gene annotations from NCBI and FlyBase. The latest versions at the time of study for the genomes of the original 12 sequenced species (ananassae v1.05, erecta v1.05, grimshawi v1.3, melanogaster v6.10, mojavensis v1.04, persimilis v1.3, pseudoobscura v3.04, sechellia v1.3, simulans v2.02, virilis v1.06, willistoni v1.05i, and yakuba v1.05) were downloaded from FlyBase  and 13 other species (arizonae, biarmipes, bipectinata, busckii, elegans, eugracilis, ficusphila, kikkawai, miranda, navojoa, rhopaloa, suzukii, and takahashii) were downloaded from NCBI . To ensure that each gene from the 25 Drosophila species was counted only once in our gene family analysis, we used only the longest isoform of each protein in each species. We then performed an all-vs-all BLAST search  on these filtered sequences. The resulting e-values from the search were used as the main clustering criterion for the MCL (Markov cluster algorithm) program to group peptides into gene families .This resulted in 17,330 clusters. We then removed all clusters not present in the Drosophila ancestor, resulting in 9379 gene families. An ultrametric phylogeny with branch lengths in millions of years (my) was inferred using MCL in a similar fashion, with the addition of the genome of the house fly, Musca domestica, as an outgroup and utilizing single-copy orthogroups between all 26 species . Calibration points at the split of D. pseudoobscura/D. melanogaster (49–59 my), D. melanogaster/D. grimshawi (64–74 my), and Musca domestica/D. melanogaster (156 my) were from Timetree.org [78, 79]. With the gene family data and ultrametric phylogeny as input, we estimated gene gain and loss rates (λ) with CAFE v3.0 . This version of CAFE is able to estimate the amount of assembly and annotation error (ε) present in the input data using a distribution across the observed gene family counts and a pseudo-likelihood search. CAFE is then able to correct for this error and obtain a more accurate estimate of λ. We find an ε of about 0.04, which implies that 4% of gene families have observed counts that are not equal to their true counts. After correcting for this error rate, we find λ = 0.0034. This value for ε is on par with those previously reported for Drosophila (Additional file 10: Table S3; ). However, this λ estimate is much higher than the previous reported from 12 Drosophila species (Additional file 10: Table S3; [4, 37]), indicating a much higher rate of error distributed in such a way that CAFE was unable to correct for it, or a much higher rate of gene family evolution across Drosophila than previously estimated. The 25 species Drosophila phylogeny was then manually pruned and modified to represent the 20 Drosophila species in which Sgs gene families have been annotated. Some Sgs gene families are not present in the ancestor of all 20 species, so additional pruning was done to the phylogeny for each family as necessary (see Additional file 1: Table S1). The phylogeny, Sgs gene copy numbers, and the updated rate of gene gain/loss (λ = 0.0034) were then used by CAFE to infer p-values in each lineage of each family (Additional file 11: Table S4). Low p-values (< 0.01) may indicate a greater extent of gene family change along a lineage than is expected with the given λ value, and therefore may represent rapid evolution. Polymorphism in D. melanogaster was investigated in the coding regions, especially the repeat number variation (RNV). We intended to use the data from the Drosophila Genome Nexus study ([49, 80], available at the Popfly web site ) to assess RNV. This database contains resequenced and aligned genomes of hundreds of D. melanogaster lines from about 30 populations from all over the world. Those data, like most D. melanogaster populations’ and other species’ genomes were obtained using NGS technologies, which yielded short reads. The data were often not accurate in repeat regions, likely because short reads may be not properly assembled when there are numerous short tandem repeats, and thus could not be used for counting RNV. Thus, experimentally, using single-fly DNAs, we amplified and sequenced the repeat-containing Sgs3 and Sgs4 from one or a few individual flies from several strains or natural populations available at the laboratory (French Guyana, Ethiopia, France, Benin, Ivory Coast, India, Comores, and the laboratory strain Canton S), and from a number of lines used in the Drosophila Genome Nexus study (Table 4). In addition, we investigated the occurrence of possible premature termination codons in gene alignments from the Drosophila Nexus database [49, 80], available at the Popfly web site  and checked the results by PCR in Sgs4 and Sgs5 (Table 4). We also used data from the Drosophila Nexus database to study polymorphism and divergence in Sgs5 and Sgs5bis, which are devoid of repeats, and are not too short. Four populations represented by numerous lines were retained for analysis: ZI (Siavonga, Zambia), for the ancestral geographical range, EF (Fiche, Ethiopia), which shows overall rather large differentiation (Fst) with most other populations , and FR (France) and RAL (Raleigh, USA) for the worldwide populations. Diversity and divergence indices were computed with DnaSP . Experimental sequences were deposited to GenBank with accessions MH019984-MH020055. The authors thank Dr. Georges Feller for comments on the disordered protein regions, and Dr. Amir Yassin for critical reading of the manuscript. The authors are grateful to three anonymous reviewers for their fruitful comments. The research leading to this paper has received funding from the regular annual funding of CNRS to JLDL, MB and VCO and from the European Research Council under the European Community’s Seventh Framework Program (FP7/2007–2013 Grant Agreement no. 337579) to VCO. GWCT is supported by NSF DBI-1564611. The funding bodies had no role in study design, analysis and interpretation, or writing the manuscript. VCO and JLDL designed the study and analyzed data; JLDL and MB performed experimental work; GWCT performed CAFE analysis; JLDL, VCO and GWCT wrote the manuscript. All authors have read and approved the manuscript. Hickner PV, Rivaldi CL, Johnson CM, Siddappaji M, Raster GJ, Syed Z. 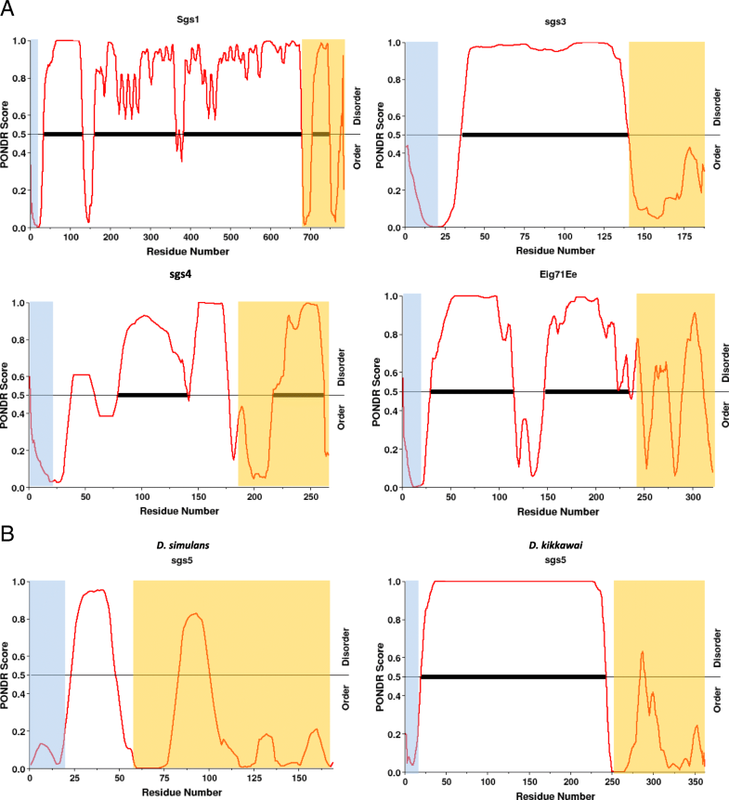 The making of a pest: insights from the evolution of chemosensory receptor families in a pestiferous and invasive fly, Drosophila suzukii. BMC Genomics. 2016;17. https://doi.org/10.1186/s12864%2D12016%2D12983-12869. Thomas GWC, Hahn MW. Drosophila 25 species phylogeny. FigShare. 2017. https://doi.org/10.6084/m6089.figshare.5450602.